The Colorado-based Hustle Kings are a very interesting proposition. Essentially, the band is a duo, comprising Dan Treanor on vocals, harps, bass, beatboxing and sequencer and Bruce Collins on vocals, drums, bass, keyboards and percussion. Various guest vocalists appear throughout, including David Booker, Erica Brown, Scott Hackler, Randall Dubis, Clarence Cage, Marc Bilker and Merrian Johnson. And the voices of the great Frankie Lee and Son House are sampled on “Brand New Walkin’ Blues” and “Tears Fall Like Rain” respectively. 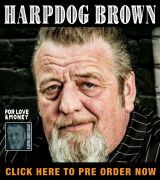 Treanor wrote four of the 10 songs on Harpin’ Our Blues Away. The tasty covers range from the traditional “Walkin’ Blues” or “Rollin’ & Tumblin'”, to Elmore James’ “Look On Yonder Wall”, Little Walter’s “My Babe”, Curtis Mayfield’s “People Get Ready” and even Van Morrison’s “Days Like This”. It is unlikely however that you will have heard these songs played like this before. “My Babe” is dipped in the swampy rhythms of Louisiana, with a harp melody very different from Little Walter’s trademark attack. Likewise, “Yonder Wall”, with its gospel-style vocals and bouncing one-chord groove, is a long way removed from James’ classic shuffle. “Rollin’ & Tumblin'” starts and ends with a sampled chain gang chant, the groove of which continues throughout the song. “Days Like These” is turned into a gospel piece, while “People Get Ready”, which stays perhaps closest to the original, is played slightly faster than one might expect, giving the track an added impetus. Treanor’s own songs fit neatly alongside the covers, often containing a nod to some classic blues tunes. “Water From The Well” has echoes of Taj Mahal’s “Paint My Mailbox Blue” while also incorporating a little Western swing. “Mean Woman Blues” meanwhile hints at Billy Boy Arnold’s “I Wish You Would”. With no guitar on the recording, the harmonica becomes the primary rhythmic and soloing instrument and Treanor displays an endless inventiveness in laying down a series of memorable lines, sometimes through multiple over-tracks. In addition, the subtle use of a sequencer gives a number of tracks an injection of modernity, with the end result sometimes reminiscent of the wonderful Rick Holmstrom’s cruelly-underappreciated Hydraulic Groove, or even the “Praise You” era of Fatboy Slim, while still having both feet solidly in blues territory. The songs are primarily mid-paced and built around the hypnotic grooves laid down by Collins and Treanor’s melodic harmonica playing. The guest singers all add something spicy to their performances. Clarence Cage’s Buddy Guy-esque falsetto on “Tears Fall Like Rain” is particularly affecting, as is Merrian Johnson’s turn on “Days Like This”. 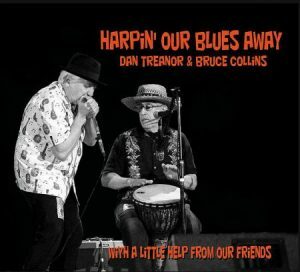 Treanor and Collins produced and recorded the album (with mastering by Gary Flori) at Sound Stream Studio in Arvana, Colorado, and they have caught a warm “live” sound. Harpin’ Our Blues Away is a very impressive, inventive and enjoyable release. 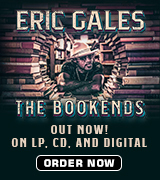 Warmly recommended to anyone who likes to hear traditional blues given a modern shot in arm.